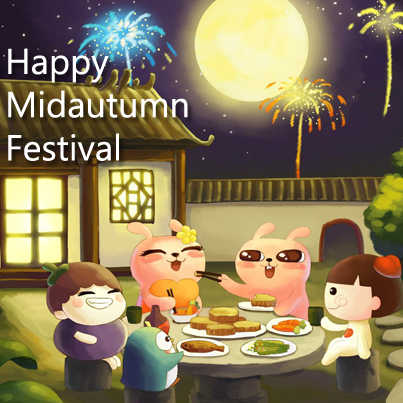 The Mid-Autumn Festival or commonly known as the Mooncake Festival or Lantern Festival, is celebrated on the 15th day of the 8th month of the lunar calendar. The 8th lunar month marks an auspicious beginning again after a bad 7th month of the Hungry Ghost Festival which ends on 19th September 2017. Legends say that the moon is at its brightest and roundest during this month. The 8th lunar month is extremely great for starting of new businesses, moving into a new home, travelling, moving to a new job, getting married and embarking on something new. It is time of the year to fill up your home with feng shui symbols of good meanings, foodstuffs and spark up your wealth luck for a good year end. The Mid Autumn is a special month for the women in ancient China. The 15th day of the 8th lunar month was one of the rare opportunities for women to socialize outdoor. Thus, it is considered as the women's festival. The moon symbolizes beauty and elegance. It is the yin or female element of mankind, thus the festive season is associated to trust, passiveness and harmony. Around 2170B.C, the legend of Lady Chang Er emerged. During that time, the earth was surrounded by 10 suns taking turns to illuminate it. At one time, all the 10 suns threatened to appear at the same time together and this was expected to harm people and crops. A famous but tyrannical archer shot down 9 suns and became a king. He was then being presented the elixir of life from the goddess of the West. His beautiful wife Chang Er drank the potion to save the people from Hou Yi's tyrannical rule. After drinking the potion, she floated to the moon. Another version of the same legend said that Hou Yi shot down 9 suns and left with only one supplying heat to the earth. He was unaware that the suns actually were the sons of the Jade Emperor. To avenge their deaths, Hou Yi and his family were punished. The goddess of the West took pity on them and gave Hou Yi the potion of immortality. He presented it to his wife who drank it and floated to the moon to reside there as the Lady of the Moon on the 15th day of the 8th lunar moon. Ever since, people have prayed to her to have their wishes fulfilled. The second legend said there were three sages who transformed themselves into pitiful old men. They begged the rabbit, monkey and fox for food. The monkey and fox offered food to the old men. However, the rabbit had nothing, so it offered its own flesh and jumped into fire to sacrifice for the old man. This noble deed touched the sages, and let the Rabbit live in the Moon Palace where the rabbit became the Jade Rabbit. How did the mooncake came about? During the Yuan Dynasty (AD 1280-1368), the Mongolians ruled China after destroying Sung Dynasty. Under Mongolian rule, the Han people were oppressed and being made slaves. A rebellion was planned by Chu Yan Chang during the Mid Autumn Festival. He ordered the making of special cakes. Backed into each mooncake was the message "revolt on the 15th of the 8th Moon". Mooncakes were sold openly everywhere then to all the Han people who united to successfully rebel and overthrew the Mongolian Government. Today, mooncakes very much remind everyone of this rebellion. To commemorate the Lady of the Moon Chang Er, people would gather with friends, family or relatives to gaze at the moon. They would lay lots of foodstuffs such as mooncakes, cookies, cakes and fruits for a feast together during this season while gazing at the beautiful moon. Some would even make wishes or pray to the moon as moon energy is strongest during this month. Singles would make wishes to get married while married couples would ask for descendants luck and harmony. Those who are eager to get rich would make their wealth ships and placed wishfulfilling symbols in their homes to tap to such luck as the 8th month is simply so auspicious. To obtain ultimate good feng shui, both yin and yang energies must be in equilibrium. Yin energy must not be neglected to the extent that they become absent in our lives. The moon exerts clear yin energy through its moonlight and is considered auspicious type of yin energy as it is not stagnant or stale. Yin energies from the moon is considered pure, unlike the stagnant kind of yin energy from dying plants or dark quiet areas. Many legends are associated to the moon. For example, God of Marriage lives in the moon and ladies wanting to get a husband needs to tap to the energy from the moon. One of the simple rituals to activate marriage luck is to use the Magic Love Mirror or Magic Peacock Mirror according to Taoist feng shui. Just absorb the energy from moon light and use it as a makeup mirror. It is also associated to the popular Three Legged Money Frog. The Money Frog was once the wife of one of the Eight Immortals and one day she stole the elixir of life from her husband. As a penalty, she was banished to live in the moon. It is a good time of the year in the 8th lunar month to invite the Three Legged Money Frogs into our homes. Place 9 of them scattered around in your living room under your chairs, cabinets or tables. 1.The moon energy is strongest during the 8th lunar month, therefore ladies who desire to be pretty must not miss the opportunity to absorb this strong yin energy from the moon. Such energy resembles elegance and beauty. Use the Magic Peacock Mirror to absorb such energy and use the mirror onto faces of ladies to enhance beauty and lady-like luck! This would make them hard to resist from men. 2. Filled up your space with food and fruit images. Fresh and yummy fruits represent the "about-to-be-harvested" produce of the motherland and displaying them in your dining room or living area on an auspicious month brings prosperity to the family. The luckiest of all fruit symbols are like apples, grapes and peaches. Especially the grapes, it implies prosperity of material kind, a life full of luxury and plenty to eat. 3. 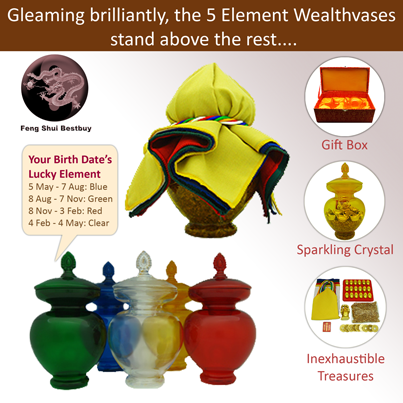 For ambitious people who desire to activate their wealth luck during this auspicious month, invite the Treasure Wealth Vase, the Wealth Ship, the Money Frog and the Wealth God Kwan Kung into your homes and offices.